Internationally acclaimed DJ/producer EDX is bringing his No Xcuses North American Bus Tour to Webster Hall on Saturday, February 20, 2016. Bringing some friends along for the ride, Maurizio Colella—better known as EDX—headlines the No Xcuses tour with support from Nora En Pure, Croatia Squad, and Antonio Giacca. Colella has made his No Xcuses radio show and accompanying party series a staple among the dance music enthusiasts. EDX has built a distinguishable discography consisting of solo productions, collaborative projects, and signature remixes. *Contest ends Friday, February 19 at 11 PM EST. Following his tour stop at New York’s legendary Webster Hall nightclub, EDX & Friends will bring No Xcuses to SET Nightclub during Miami Music Week 2016 on Fri., March 18. Doors for the 19+ event open at 10 PM. The Marlin Room features tunes from Sean Sharp + DLO + Suga Ray. The Studio: Bassment Saturdays continue with local NYC favorite, Subset. 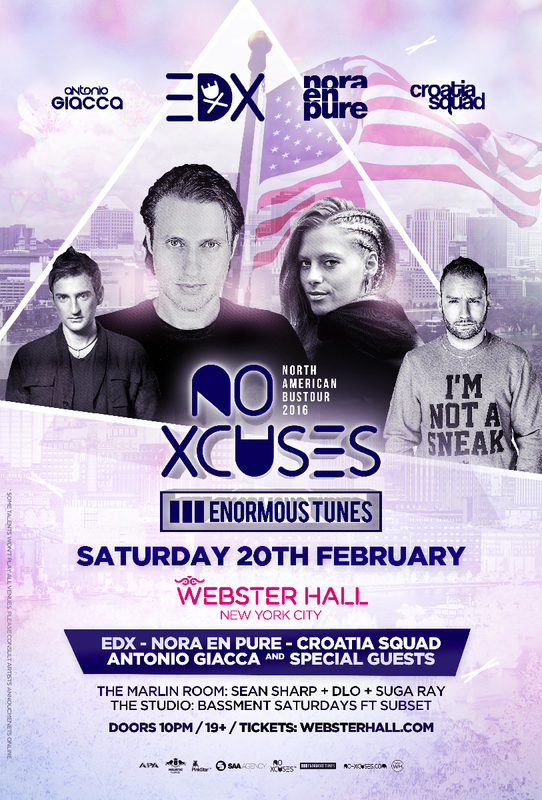 Tickets for EDX No Xcuses North American Bus Tour 2016 stop at Webster Hall on Sat., Feb. 20 are available HERE.